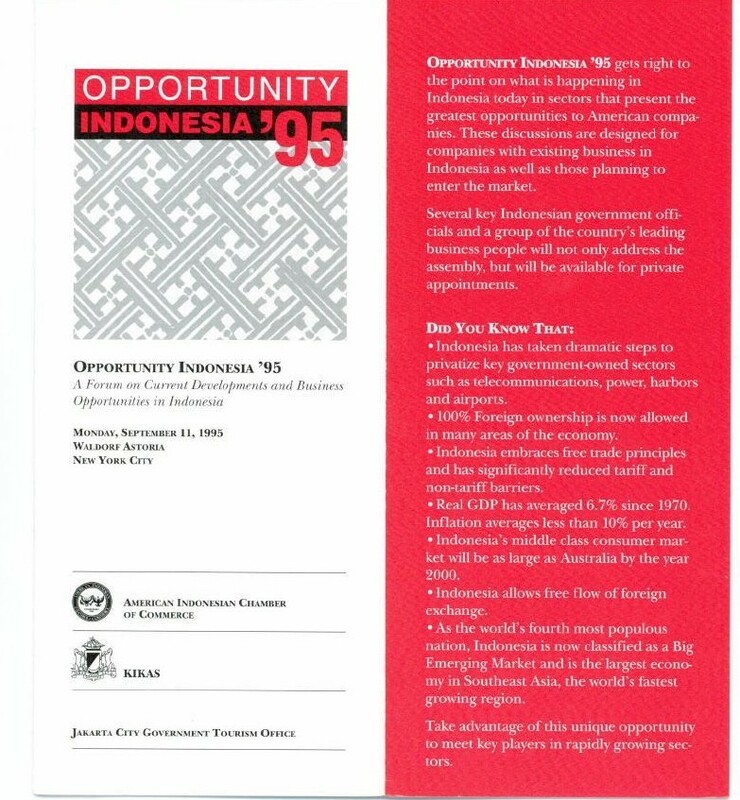 The success of the TTI Program led to several additional joint programs in the 1990’s beginning with Opportunity Indonesia ’95, a series of business forums in New York, Chicago, Washington, San Francisco and Los Angeles that attracted several hundred American companies to learn about Indonesia, newly designated by the US government as a Big Emerging Market. Tony Agus Ardie, Chairman of KIKAS (US Committee of the Indonesian Chamber of Commerce) led the largest business delegation ever assembled to the US: 70 Indonesian CEO’s participated as speakers or moderators and held one –on –one meetings with many American counterparts. The discussions on finance, mining and energy, and infrastructure brought new ideas to Indonesia’s policy makers. Major US investments in Indonesia followed. Taken as a whole, these 1990’s promotions helped to double two-way trade between the US and Indonesia over a ten year period, a success in part owed to AICC’s vision that the US-Indonesia commercial relationship could always be improved. By 1996, the US had become the largest market for Indonesia’s manufactured products whereas in 1986, our largest imports were commodities.